The multiplication operation is present in many parts of a digital system or digital computer, most notably in signal processing, graphics and scientific computation. With advances in technology, various techniques have been proposed to design multipliers, which offer high speed, low power consumption and lesser area. Thus making them suitable for various high speeds, low power compact VLSI implementations. These three parameters i.e. power, area and speed are always traded off. This thesis work is devoted for the design and simulation of Radix-8 Booth Encoder multiplier for signed-unsigned numbers. The Radix-8 Booth Encoder circuit generates n/3 the partial products in parallel. By extending sign bit of the operands and generating an additional partial product the signed of unsigned Radix-8 Booth Encoder multiplier is obtained. The Carry Save Adder (CSA) tree and the final Carry Look ahead (CLA) adder used to speed up the multiplier operation. Since signed and unsigned multiplication operation is performed by the same multiplier unit the required hardware and the chip area reduces and this in turn reduces power dissipation and cost of a system. Verilog coding of multiplier for signed and unsigned numbers using Radix-4 booth encoder and Radix-8 booth encoder for 8X8 bit multiplication and their FPGA implementation by Xilinx Synthesis Tool on Spartan 3 kit have been done. The output has been displayed on LED of Spartan 3 kit. MLA MINU THOMAS. "DESIGN AND SIMULATION OF RADIX-8 BOOTH ENCODER MULTIPLIER FOR SIGNED AND UNSIGNED NUMBERS." International Journal for Innovative Research in Science & Technology 1.1 (2014) : 1-10. APA MINU THOMAS. (2014). DESIGN AND SIMULATION OF RADIX-8 BOOTH ENCODER MULTIPLIER FOR SIGNED AND UNSIGNED NUMBERS. International Journal for Innovative Research in Science & Technology, 1(1), 1-10. Chicago MINU THOMAS. "DESIGN AND SIMULATION OF RADIX-8 BOOTH ENCODER MULTIPLIER FOR SIGNED AND UNSIGNED NUMBERS." International Journal for Innovative Research in Science & Technology 1, no. 1 (2014) : 1-10. A methodology for landslide hazard zonation mapping using an integrated remote sensing and GIS approach is presented. Landslides often affect Kodaikanal, a well-known tourist hill resort in south India, The hills in Kodaikanal have a fairly thick weathered overburden that tend to slide during heavy rainfall. Therefore the frequency of landslides in these areas is higher. This study represents the causative factors of the Kodaikanal landslides. Here The landslide inventory map shows that, during the past 10 years, out of 66 landslide incidences, 35 incidences were fallen along the Vatlagundu-Kodaikanal-Palani Ghat roads. Secondly thematic maps were prepared on the various causative factors that is geosystem parameters like geology, lineaments/faults, geomorphology, land use/land cover, drainage system, slope, etc. High resolution Geo-eye satellite data, LANDSAT-TM and ASTER images have been used to generate a few of these thematic maps. To identify the vulnerable areas, the above-mentioned parameters were analyzed in a GIS by assigning appropriate ranks and weights. The result is a landslide hazard zonation map showing regions with varying degrees of vulnerability to landslides. Detailed landslide vulnerability analysis along road corridor. This prepared hazard zonation map will enable to propose and implement suitable mitigating measures, thus preventing loss of life and property in the Kodaikanal hills. An additional study made over landslide vulnerability analysis along road corridor region, using lineament and drainage maps. Though the heavy rainfall is triggering landslides in western-Ghat region, the other causative factors in inducing landslides are anthropogenic activities, geosystem parameters like structure, geomorphology, land use practices, drainage system, etc. MLA RAJAMOHAN M R, Anand B, Balakrishnan P, Praveenraj Durai and JoyJohnson A. "Landslide Hazard Zonation Using Geospatial Technology In Parts Of Kodaikanal Hill Region, Tamilnadu." International Journal for Innovative Research in Science & Technology 1.1 (2014) : 11-17. APA RAJAMOHAN M R, Anand B, Balakrishnan P, Praveenraj Durai and JoyJohnson A. (2014). Landslide Hazard Zonation Using Geospatial Technology In Parts Of Kodaikanal Hill Region, Tamilnadu. International Journal for Innovative Research in Science & Technology, 1(1), 11-17. Chicago RAJAMOHAN M R, Anand B, Balakrishnan P, Praveenraj Durai and JoyJohnson A. "Landslide Hazard Zonation Using Geospatial Technology In Parts Of Kodaikanal Hill Region, Tamilnadu." International Journal for Innovative Research in Science & Technology 1, no. 1 (2014) : 11-17. Underwater Sensor Networks are highly distributed self-organized systems. I highlight potential applications to off-shore oilfields for seismic monitoring, equipment monitoring, and underwater robotics. Its identify research directions in short-range acoustic communications, MAC, time synchronization, and localization protocols for high latency acoustic networks, long-duration network sleeping, and application-level data scheduling. In this survey paper, I provide a full view of the studies in this area. MLA Komal Patel. "Underwater Sensor Networking." International Journal for Innovative Research in Science & Technology 1.1 (2014) : 18-21. APA Komal Patel. (2014). Underwater Sensor Networking. International Journal for Innovative Research in Science & Technology, 1(1), 18-21. Chicago Komal Patel. "Underwater Sensor Networking." International Journal for Innovative Research in Science & Technology 1, no. 1 (2014) : 18-21. Transactional standards in distributed transactional systems, allows heterogeneous resources to participate in an Atomic Commitment Protocol (ACP). An ACP ensures the atomicity of distributed transactions even in the presence of site failures. Atomic commitment is one of the key functionalities of modern distributed information systems. Two-Phase Commit Protocol (2PC) is a well-known and widely accepted standard algorithm which safeguards the ACID properties of a transaction in the distributed system. But, since this algorithm introduces a substantial time delay and is a blocking protocol, there has always been an open challenge or issue to solve while designing a reliable, highly available and efficient distributed system. Blocking in distributed transactions, occurs during two-phase commit processing, when the coordinator itself fails and at the same time one or more sites are ready to commit the transaction. Several variants of 2PC, optimized protocols and non-blocking protocols have been proposed in the literature, but none of them combines high efficiency during normal processing with fault-tolerance (i.e. non-blocking). Generally the proposed protocols either violate site autonomy or are inherently more costly in time and increase communication overhead. This paper proposes a Decentralized Non-Blocking Two Phase Commit Protocol that will drastically reduce the cost of distributed transaction commitment in terms of time delay to reach a common view, i.e. a consensus between the cooperating processes across various sites on the global state, and message complexity as well. Since this algorithm is decentralized in nature, it will overcome the disadvantage of centralized architecture which relies heavily on the central computing unit (master controller or co-ordinator). This paper describes a token-based non-blocking commitment protocol that also subsumes the functions of termination and recovery protocols. The protocol survives any single site crash or network partition provided that the failure is not falsely detected. The protocol is correct despite the occurrence of failures at multiplesites and whether or not failures are falsely detected. Performance measures show that the protocol is significantly faster and efficient than obsolete 2PC.The protocol is simple, and has several advantages, including prevention of deadlocks, avoids blocking and single point of failure kind of dependencies as well. The protocol is equipped with fast abort properties, i.e., aborting a transaction as soon as possible if some site wants to abort which is involved in distributed transaction, and the fast commit property, i.e., committing a transaction as soon as possible when all the sites are ready to commit, and no site crashes. This protocol allows operational sites to continue transaction processing even though site failures have occurred. So for an algorithm to be efficient, it is desirable to keep the number of message exchanges on a low level and keeping the number of phases as minimal as possible, which redirect us to the two-phase commit protocol. In order to achieve the non-blocking property there have been presented a variety of solutions throughout the years. To maintain a low level of message exchanges the protocol uses the concept of token and does not uses acknowledgements, as a substitute the participants use the Store and Forward manner and update their vote on the token. And since the architecture is decentralized, thereâ€™s no need to elect any co-ordinator either. The vast majority of complex systems like conventional distributed databases, transaction processing monitor, or distributed object platforms implement atomic commitment using some variation of 2 Phase Commit, (although 2PC may block under certain conditions) and since this algorithm inherits few properties of 2PC this will make the protocol compatible with the existing DDBS's. MLA HARIT SHARMA. "Token Based Decentralized Non-Blocking Two Phase Commit Algorithm." International Journal for Innovative Research in Science & Technology 1.1 (2014) : 22-27. APA HARIT SHARMA. (2014). Token Based Decentralized Non-Blocking Two Phase Commit Algorithm. International Journal for Innovative Research in Science & Technology, 1(1), 22-27. Chicago HARIT SHARMA. "Token Based Decentralized Non-Blocking Two Phase Commit Algorithm." International Journal for Innovative Research in Science & Technology 1, no. 1 (2014) : 22-27. In the recent days, the traffic density has risen to a very high level. Increase in traffic density has resulted in spending long hours in traffic for short distances. The solution can be implemented by automating the traffic signals using the concept of "Autonomic Computing"-computing systems that can manage themselves. Using the characteristics of Autonomic computing and Wireless Sensor Networks , the traffic signals can me made smarter and intelligent by making it react to the traffic density and thus increasing or decreasing the waiting time accordingly. MLA Ullas Aithal K and Dr. Shantharam Nayak. "Smart Traffic Signals using Autonomic Computing." International Journal for Innovative Research in Science & Technology 1.1 (2014) : 28-30. APA Ullas Aithal K and Dr. Shantharam Nayak. (2014). Smart Traffic Signals using Autonomic Computing. 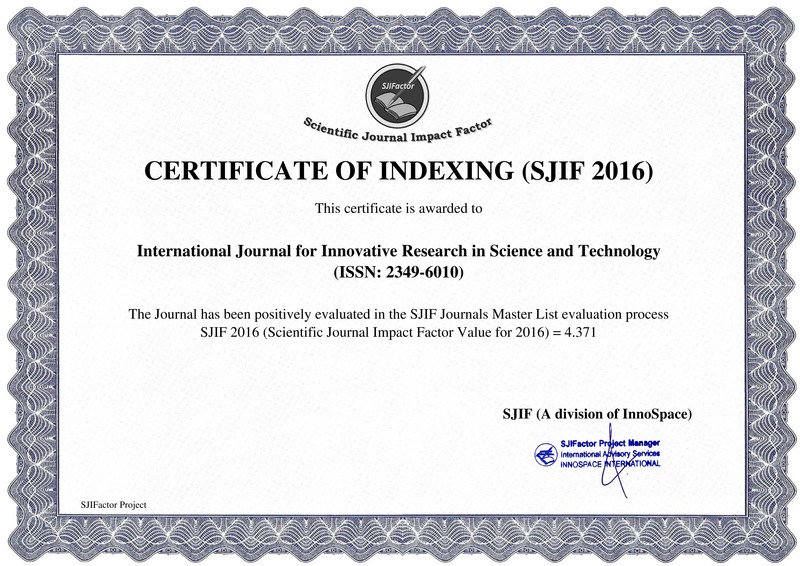 International Journal for Innovative Research in Science & Technology, 1(1), 28-30. Chicago Ullas Aithal K and Dr. Shantharam Nayak. "Smart Traffic Signals using Autonomic Computing." International Journal for Innovative Research in Science & Technology 1, no. 1 (2014) : 28-30. Air pollution is most important from the public health of view, because every individual person breaths approximately 22000 times a day, inhaling about 15 to 22 kg of air daily. Polluted air causes physical ill effect decides undesirable aestheticand physiological effects. Air pollution can be defined as addition to our atmosphere of any material, which will have a dexterous effect on life upon our planet. The main pollutants contribute by automobile are carbon monoxide (CO), unburned hydrocarbon (UBHC), oxides of nitrogen (NOx) and Lead. Automobiles are not the only sources of air pollution, other sources such as electric power generating stations, industrial and domestic fuel consumption, refuse burning, industrial processing etc. also contribute heavily to contamination of our environment so it is imperative that serious attempts should be made to conserve of our environment from degradation. An Aqua Silencer is an attempt, in this direction, it is mainly dealing with control of emission and noise. An Aqua Silencer is fitted to the exhaust pipe of engine. Sound produced under water is less hearable than it produced in atmosphere. This mainly because of small sprockets in water molecules, which lowers its amplitude thus, lowers the sound level. Because of this property water is used in this silencer and hence its name AQUA SILENCER. The noise and smoke level is considerable less then the conventional silencer, it is cheaper, no need of catalytic converter and easy to install. MLA Kevalkumar Ishwarbhai Patel and Swastik Gajjar. "Design and development of aqua silencer for two stroke petrol engine." International Journal for Innovative Research in Science & Technology 1.1 (2014) : 31-38. APA Kevalkumar Ishwarbhai Patel and Swastik Gajjar. (2014). Design and development of aqua silencer for two stroke petrol engine. International Journal for Innovative Research in Science & Technology, 1(1), 31-38. Chicago Kevalkumar Ishwarbhai Patel and Swastik Gajjar. "Design and development of aqua silencer for two stroke petrol engine." International Journal for Innovative Research in Science & Technology 1, no. 1 (2014) : 31-38. A low power 1MHz Full programmable frequency divider in 45-nm CMOS process is presented in this paper. The divide ratio can be varied from 2400 to 2431 in a step size of 1.The divider consists of a divide-by-2 circuit, divide-by-2/3 prescaler, divide-by-32/33 prescaler, a programmable pulse-swallow counter. The post simulation results demonstrate that the divider can operate with the input frequency ranging from 2.46GHz-2.541GHz. Measured results show that programmable divider consuming only 613.39 ÂµW at 1V power supply. The programmable frequency divider is design and simulated on Tanner EDA Tool using 45nm CMOS process technology with supply voltage 1 V.
MLA Dabhi Rajeshkumar Ambaram and Bharat H. Nagpara. "A Low Power 1MHz Fully Programmable Frequency Divider in 45nm CMOS Technology." International Journal for Innovative Research in Science & Technology 1.1 (2014) : 39-46. APA Dabhi Rajeshkumar Ambaram and Bharat H. Nagpara. (2014). A Low Power 1MHz Fully Programmable Frequency Divider in 45nm CMOS Technology. International Journal for Innovative Research in Science & Technology, 1(1), 39-46. Chicago Dabhi Rajeshkumar Ambaram and Bharat H. Nagpara. "A Low Power 1MHz Fully Programmable Frequency Divider in 45nm CMOS Technology." International Journal for Innovative Research in Science & Technology 1, no. 1 (2014) : 39-46. Optimal cropping pattern optimization model is formulated in which the surface and ground water as decision variables. Linear programming is used for multiple crop models and dynamic programming for single crop model. In irrigated agriculture, where various crops are competing for a limited quantity of land and water resources, linear programming is one of the best tools for optimal allocation of land and water resources (smith, 1973; mAji and heady, 1980; loucks et al., 1981. Salman et al (2001) present a linear programming model to derive regional water demands based on optimized regional cropping pattern with variable water prices based on quality. MLA Mahek Aparnathi and prof.Divya K Bhatt. "LINEAR PROGRAMMING MODEL FOR OPTIMAL CROPPING PATTERN FOR ECONOMIC BENEFITS OF MRBC COMMAND AREA." International Journal for Innovative Research in Science & Technology 1.1 (2014) : 47-54. APA Mahek Aparnathi and prof.Divya K Bhatt. (2014). LINEAR PROGRAMMING MODEL FOR OPTIMAL CROPPING PATTERN FOR ECONOMIC BENEFITS OF MRBC COMMAND AREA. International Journal for Innovative Research in Science & Technology, 1(1), 47-54. Chicago Mahek Aparnathi and prof.Divya K Bhatt. "LINEAR PROGRAMMING MODEL FOR OPTIMAL CROPPING PATTERN FOR ECONOMIC BENEFITS OF MRBC COMMAND AREA." International Journal for Innovative Research in Science & Technology 1, no. 1 (2014) : 47-54. Over the years a lot of research has been done by various researchers in this area of computational fluid dynamics. Due to its extensive applications in various industries like the aerodynamic extrusion of plastic sheets, hybrid-powered engines, manufacturing of plastic and rubber sheets, in a cooling bath cooling of a large metallic plate, which may be an electrolyte, machining etc., the area of stretching sheet in computational fluid dynamics is growing at a fast rate. The aim of the present study is to explore this enormous growing area and find out how much work has already been done in this area. In the present article, the main focus is on the stretching sheet and its various parameters like the cases when the flow is unsteady, the oblique incidence of the flow and study of the effect of porosity on various parameters of the fluid. MLA PARVEEN KUMAR. "Effect of porosity, oblique incidence and unsteady flow on a fluid." International Journal for Innovative Research in Science & Technology 1.1 (2014) : 55-57. APA PARVEEN KUMAR. (2014). Effect of porosity, oblique incidence and unsteady flow on a fluid. International Journal for Innovative Research in Science & Technology, 1(1), 55-57. Chicago PARVEEN KUMAR. "Effect of porosity, oblique incidence and unsteady flow on a fluid." International Journal for Innovative Research in Science & Technology 1, no. 1 (2014) : 55-57. Pressure vessels are widely used in various industries. A Horizontal pressure vessel has been designed using graphical based software named PVElite. For designing of nozzle, saddle supported pressure vessel some input parameters like volume, inside diameter, design pressure (either inside pressure or external pressure), temperature, material, processing fluid. Etc. is required. PVElite gives thickness of shell, thickness of head, height of head, thickness of nozzle,. The high stresses at intersections are caused by discontinuity shear stresses and moments which exist to maintain compatibility at the junctions. PVElite calculate this local stresses according to welding research council (WRC) 107. MLA shyam gupta and Ashish desai. "Design of horizontal pressure vessel using PVElite software." International Journal for Innovative Research in Science & Technology 1.1 (2014) : 58-63. APA shyam gupta and Ashish desai. (2014). Design of horizontal pressure vessel using PVElite software. International Journal for Innovative Research in Science & Technology, 1(1), 58-63. Chicago shyam gupta and Ashish desai. "Design of horizontal pressure vessel using PVElite software." International Journal for Innovative Research in Science & Technology 1, no. 1 (2014) : 58-63.